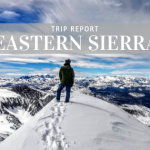 With the fresh snow we’ve been comes a fresh look and the latest pack reviews from our TMS/Boreas Adventure Team! Read on to see how the Boreas Lost Coast 60 held up against two of our most fearless and mighty pack testers! 1) How do you like the way the pack sits on your back? (ROMMEL) The Lost Coast 60 was my traveling “Base Camp”. 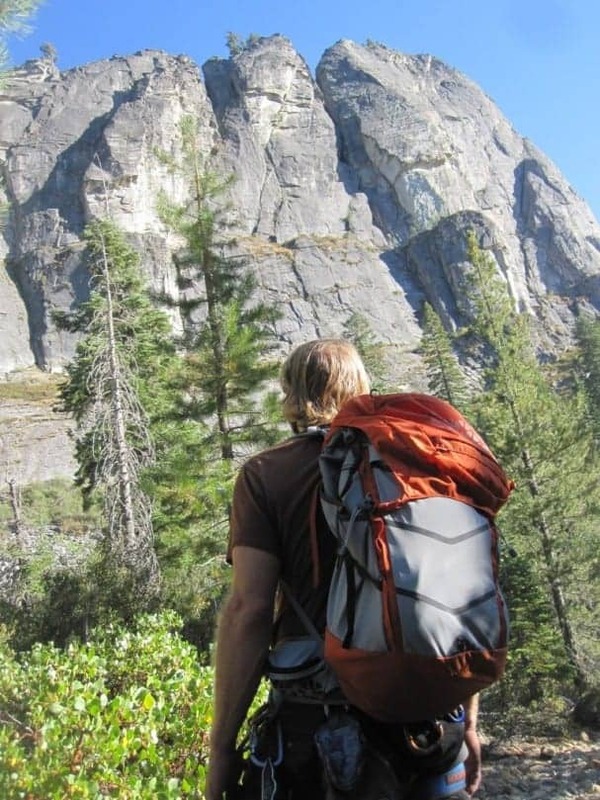 The pack fit great with even weight distribution and was extremely light. 2) Are there any changes you would make to the belt buckle? (ROMMEL) The only suggestion I have about the belt is a change in the pockets. The hip belt pockets were in the way (just a little) during my climbs. 3) What do you feel this pack is best suited to do? (ROMMEL) Overall, it worked terrific for climbing. (ROMMEL) I was eyeing the change Black Diamond made to their packs by going to a “Minimalist” feature design. 5) What did you like most about the pack? (ROMMEL) One of the most impressive design qualities of this pack was how the top is situated back from the head and shoulders. For climbing this design proved invaluable, allowing for unrestricted movement of the head when climbing with a helmet on. In addition, the “soft shell” material in the front and side pockets handled being dragged over granite surprisingly well. 6) What did you like least about the pack? (ROMMEL) Once again, the only part of this pack that didn’t work specifically for climbing was the hip belt pockets because they were sometimes in the way. 7) Overall thoughts on the bag? 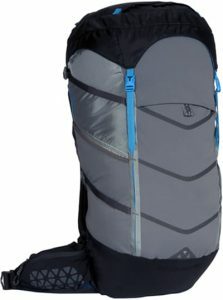 (ROMMEL) I liked this pack so much that I will be trading my Black Diamond climbing pack for the Boreas Lost Coast 60. (TIRELLA) New backpack companies always intrigue me. In a market so saturated with big-name brands, it takes a huge amount of drive and a passion for the outdoors and design to want to enter into such a competitive field. 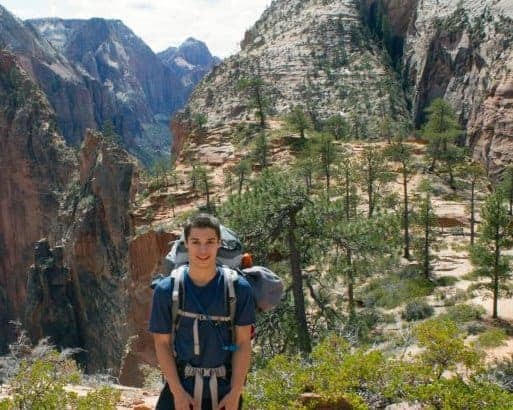 Enter Boreas, a new company from San Francisco that stresses utility and simplicity through their impressively large and diverse pack lineup. I have previously owned their small 15-liter Repack, which I found perfect for biking and stuffing basketball shoes and some clothes into when going to the gym. I had some recommendations for improvement- and lo and behold the good folks at Boreas actually listened! 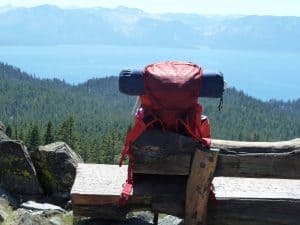 They implemented them on an updated version of the pack, so needless to say I was very excited when Tahoe Mountain Sports gave me the chance to check out Boreas’ largest backpacking pack, the Lost Coast 60! (TIRELLA) While the pack may not look “techy” on the outside, small design implementations ensure it wears incredibly comfortable. Don’t you just long for the days when internal frame packs were the new thing? When an internal frame pack was essentially a hard metal square shoved into your pack? Neither do I! Boreas’ frames are thin and lightweight, and unique in that they’re so noticeably curved. The result is that the pack wears “off your back”, allowing a space to form for air to circulate. This, coupled with the foam back, is a simple and comfortable combination. The Z-Foam on the Lost Coast is a grown-up version of that found on my Repack, and it’s incredibly comfortable. The larger size of the ridges allows more air to flow and it’s really something you have to try to believe. They are “deeper” than those found on my Repack, and the result is a more solid, supportive back area. If you are having trouble imagining the design of the back panel, imagine someone took the soles off of a pair of Reebok ZigTech shoes, softened them up, and then covered them in mesh – very comfortable! The same “ridge” design radiates onto the hip belt, although in a vertical fashion. 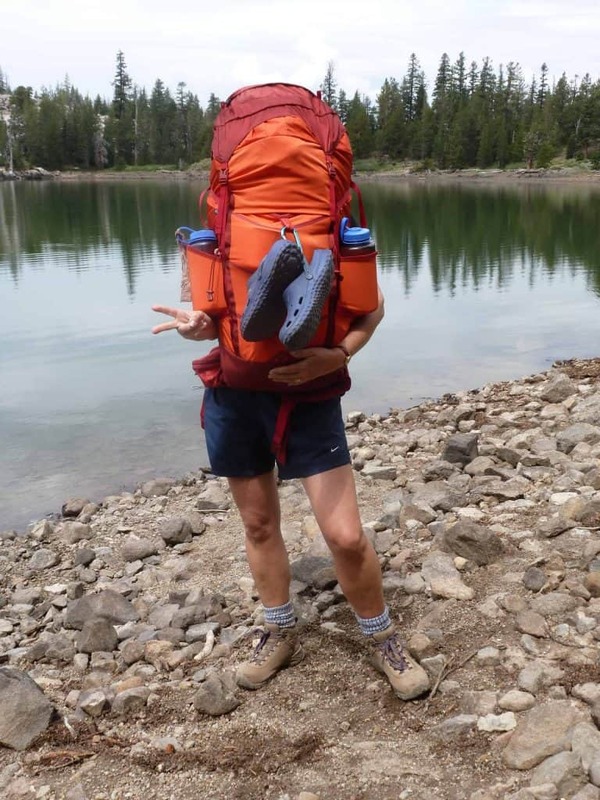 (TIRELLA) All the adjustment and compression straps, barring the hip belt buckle, are smaller and thinner than what I’m accustomed to on backpacking packs of this size. It just seems weird to not have a 2-inch wide strap to tug on. They don’t necessarily feel weak, and I’m sure it’s how Boreas cut down on weight, but I just wonder how they will hold up over the course of a year or so. (TIRELLA) This is a simple pack. It’s big, but not cavernous, and fully packed it would well serve a backpacking trip of about 4 nights, maybe a couple more if you are really skimping on camping comforts. At 3.5 pounds it doesn’t weigh much, and while that won’t put it on the short-list for through hikers or ultra lighters- it’s light enough for those of us whom, as Boreas’ website states, “care about weight but are not crazy enough to cut the handles off their toothbrushes.” Amen. (TIRELLA) I have been looking forward to testing out an upgraded version of my 15-liter Boreas Repack. (TIRELLA) Boreas has managed to fit a lot of storage space into the Lost Coast. Take for example the “double” brain compartment. While not much different than that of any other pack, what with a zipped interior pocket and straightforward design, the top of this pack has two zippered pockets. One is layered on top of the other, so you have an extra level of access and organization without losing out on storage space. The tuck-able daisy chains and ice loops, similar to the Repack 15, fold easily in and out of sight when not in use. The belt loop pockets, somewhat of an afterthought most of the time, are huge on the Lost Coast. So big I almost fit a DSLR camera inside of them. I said “almost” – but each one still easily fit a set of keys, a couple of cliff bars, a wallet and a cell phone. I would also like to make a note of the included adjustment slip. This is a small inclusion, which may be overlooked by some, but I believe it tells a ton about this company. You can have the most expensive pack in the world- but if it’s not fitted right, you won’t like it at all. 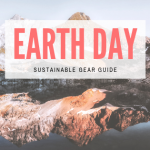 Boreas, unlike any other pack company I have supported, included a fit guide with the pack. In an easy-to-understand, conversational tone, they illustrate how to fit the pack. And more importantly, they tell you WHY (“Your goal is to get about 70% of the weight on your hips. You may have other goals too”). 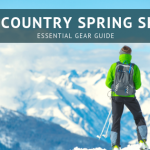 Too often in our field of outdoor sporting goods the emphasis is on the features rather than the feeling. (TIRELLA) While the pack has a ton going for it, as expected in the first iteration of a model by a new company there are some small problems I found. They are mostly harmless, and perhaps they are just a result of being used to having these features on my current pack. There is one main compartment with an obligatory hydration sleeve on the inside. This pocket probably accounts for 90% of the pack’s storage. This leads to one of my only complaints with the pack, which is a lack of access. Since the pack is essentially one large compartment, things at the bottom are incredibly tough to get to, as the only access point to the inside is through the top. While the main compartment is certainly huge, I would have liked to see just one more separate area for organizing gear. While the center compartment does have an overhanging “lid”, it would have been nice to see some kind of securing feature: even just a small strip of Velcro to prevent things from falling out or from curious hands while traveling. Another issue is that the back panel has no place “behind it” for the shoulders’ adjustment straps to fall, so they either sit uncomfortably between your back and the foam padding or flapping off to the side. Another small problem is that the hip belt doesn’t pivot. Again, this is something that I’m just used to on my pack. 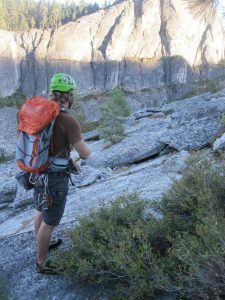 A pivoting hip belt makes the pack wear more fluidly while bending or twisting. However, that’s about it. The positives of this pack far outweigh these few drawbacks, but depending on how you use your pack, they might be bigger issues than they were for me. 7) Overall thoughts on the bag. (TIRELLA) As a San Francisco company, you can tell just by browsing their website that design is incredibly important to Boreas. Their selection of bags- all in their first model year- is expansive. At the same time, they all share a very distinctive look and you can tell the design cues were well thought out and implemented. Not just individually are these packs beautiful to look at, but the design is consistent among the whole lineup, something many companies do not choose to do. That is something that really resonates to me. The hexagonal foam padding and hip-belt pocket graphics on the Lost Coast match exactly up to those on my Repack 15. While this is not a make or break issue for a pack, it is reassuring to know that design will not lose out to utility as packs become increasingly more full of features. There’s a lot of attention to detail on the Lost Coast- from the reinforced pull-tabs on the shoulder cinch straps, to how the “V”-stitching on the front of the pack coincides with the compression straps to ensure a supported load. I especially liked the drawstring on the top of the large compartment. The zippers all feel solid (with the exception of that on the inside of the brain), and the pull-tabs are beefy and feel secure. I opted for the simple black and blue model, but there are two other color lines available for those who want to spice things up a little. It should be noted that these colors match up to the scheme on my Repack, another sign of lineup consistency that I really appreciate. This is a great pack. I think the overwhelming majority of people will be enticed by the simplicity and comfort of the Lost Coast 60. For me personally, the lack of access in a 60-liter pack is a little bit of a turnoff, however I imagine the inconvenience is less so in the 30 and 45-liter models as you have less stuff to reach for. It’s certainty not the most technical pack available, and the lack of features and easily accessible pockets may deter some buyers. Still, it’s simple, elegant design and attention to detail make it one of the best weekend backpacking packs available, in my opinion. And for the low price of $199, the Lost Coast is a steal. Thanks to Tahoe Mountain Sports and Boreas! (GREENWOOD) The large backpack is really comfortable. It breathes well and moves fluidly with me. I wish I could have pulled it closer to my shoulders with the upper shoulder strap stabilizer; the strap needs to be longer. (GREENWOOD) The hip belt is awesome although it tends to curl under It’s self. I had to pay attention to laying it flat on my hips before buckling it or it would fold under and annoy me. I enjoyed the pockets on the hip belt but the main buckle is just a little awkward, as it requires just a little more guidance than a standard three-tie buckle. I loved the ability to pull both straps inward simultaneously to equally tighten the belt! (GREENWOOD) The pack was ideal for a three-night trip. I schlepped it all over the place: long days on the trail, cross country through willow, over granite and balanced on logs. It is really a great pack with a low profile and body hugging morphism. It’s too big for day hikes but I think it may be too small for treks longer than 5 days. Put a bear canister in there and it would be REALLY tight! 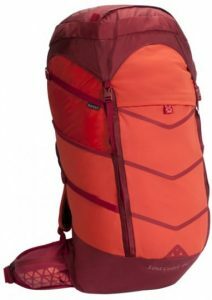 (GREENWOOD) I was really open to any pack that was lighter than my Gregory. This mountain pack helped me shave my fully loaded pack weight from 49 to 25. What a difference! I am really satisfied with it. (GREENWOOD) I really like the stretchy fabric component of this weekend pack. The hidden daisy chains are great too and there were so many pockets! I loved the plethora of pockets in the top lid. The hip belt was really comfortable. I also liked the pull “loops” on the zippers and tightening straps that made things easier to adjust. (GREENWOOD) It really prefers to lie on its back when not on my back. It falls over unless perfectly propped up, and because it refuses to stand, it is a bit awkward to put on. It has to be lifted every time instead of propped on a rock or something else and then slipped into. This could be a girl thing. Many women tend to not lift and fling a backpack on like men do; instead a lot of ladies like to wriggle into it. If it could somehow have a more square-like bottom or a firm plastic piece to help it stand that would be helpful. While I love the stretchy fabric, it does tend to pick up burrs easily and gets dirty fast, it also gets quite misshaped if not packed carefully. (GREENWOOD) I am sold on the trail pack. It really fulfilled all my needs and is comfortable, light, adaptable and manageable. The compression straps keep things tight and conforming. The stretchy fabric ads space where needed. I really like the hip belt for comfort and it’s lightweight attributes. It doesn’t have that heavy bulk that other backpacks associate with comfort, which is great. In closing, I would recommend this overnight pack to friends.